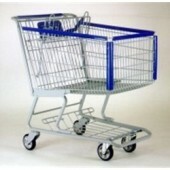 This kids metal shopping cart is a thoughtful addition for families and stores alike. 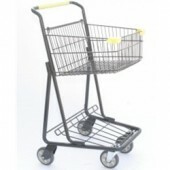 Also known as the "baby cart" or "kiddie cart", this mini grocery cart makes for a great gift. Last Day to Place Orders for Arrival by Christmas is December 13th!!! 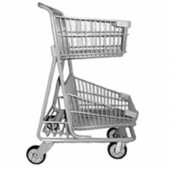 This award winning toy shopping cart virtually guarantees fun at the grocery store. Some kids just love shopping, and there is nothing more valuable to them than their own personal shopping cart. Get your kids started at an early age with this play shopping cart, durably crafted for years of shopping fun! 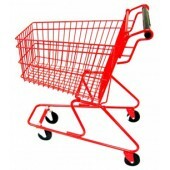 Get your cart personalized with a name or friendly message for only $1.99. Personalized carts make great gifts and add extra joy for your starting shopper. Text color comes in Red Block Font as shown in photo. 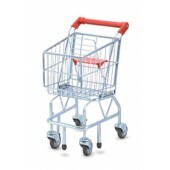 Compact two-tier grocery store shopping cart with one basket. Great for convenience stores, liquor stores, pharmacies, and small grocery stores. Available in Gray, no minimum order quantity. 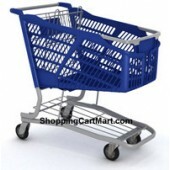 Other cart colors are available for an extra $2.00 per cart, minimum 100 carts. Ships in 2-3 weeks. Large or custom orders ship in 4-6 weeks. 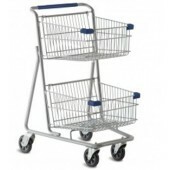 A two-tier shopping cart with two baskets. 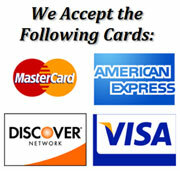 Great for convenience stores, liquor stores, pharmacies, and small grocery stores. Grocery Shopping Cart. Ideal for supermarkets and large stores.